Beaumont is excited to present the preliminary design for the streetscaping of 50 Avenue. This project will continue to support the vision of the Centre-ville area. As per the goals and objectives in the Downtown Urban Design Concept Plan (DUDCP), 50 Avenue is another critical piece of infrastructure that will support the vision, enhance the area and set the stage for continued redevelopment activities. To foster a cultural space, attract and support business opportunities, celebrate history and preserve heritage while supporting redevelopment. To reinforce the image and sense of place that 50 Avenue means to Beaumont and its residents. 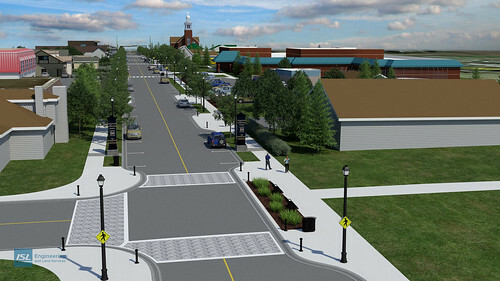 To align the vision and function of the streetscape design with high level planning documents such as Beaumont's French Village Design Guidelines (FVDG), Downtown Urban Design Concept Plan (DUDCP), Central Area Redevelopment Plan (CARP). To create a pedestrian friendly environment and promote safe pedestrian access and movement. To design for integration with adjacent land uses both today and in the future. To enhance aesthetics through tree placement, landscape, materials and street furniture. To align with existing streetscape on 50 Street while allowing for seamless expansion along other key routes in the DUDCP plan area. We invite you to review the videos and pictures below to see the proposed project. Please contact us if you have any comments or feedback.